Black mold is one of the worst fears you might have as a homeowner. Toxic black mold (Stachybotrys chartarum) grows in common household features such as carpet, drywall, insulation, and sub-flooring. It grows when these household materials have been in contact with moisture. As it grows, it releases spores into the air. Testing for mold is essential, and you should have a dwelling inspected for black mold before you buy it or sign a lease. If you suspect there may be black mold in your home, or you have never had your home tested, contact SERVPRO of Livonia for professional mold remediation services in the Metro-Detroit area. While many aspects of home-ownership can be handled in a D.I.Y. fashion, black mold is not something to be messed around with. Black mold loves to live on the carpet. Dust collects in carpet fibers and those same fibers trap the humidity and dampness that enables mold to grow. Carpets in below-ground levels are especially susceptible to mold as there is more humidity there. Carpet mold is often not visible from the surface, except in severe cases, which makes testing for it necessary even if you don't see any evidence. Air conditioning and heating vents actually create ideal conditions for black mold to grow. Dual-purpose vents that both heat and cool your house raise that risk as they are in constant use. When you have mold in your air vents, those spores are being circulated throughout your home. The sooner you can perform mold remediation procedures, the better. SERVPRO of Livonia has a 24-hour mold emergency service hotline to quickly begin the process of cleaning your air vents. Mold is unfortunately common in drywall, as it traps humidity. This is especially common as the seasons change from winter into spring. Because of the nature of it, mold in drywall is rarely visible except in severe cases. For this reason, it's imperative to have a potential home be tested for mold in the walls before you sign a lease or put down a deposit. After a water emergency strikes in a commercial building you own, your immediate concerns involve both personal losses along with the added stress and responsibility to get all of your tenants back in business or living comfortably in your units again. SERVPRO offers the resources locally and on a national level to rehabilitate even a complex commercial water damage scenario. We exceed your needs both to repair your property and also to restore the trust the companies and individuals have invested in your professional commercial management. Although burst pipes or a roof leak may start in a confined area of your office building, apartment complex or warehouse space, the resultant flood and seepage of water can spread far from the original breach. Many if not all of the businesses or residents renting from you are in peril of losing personal and professional property as well as their means to make a living if you do not take immediate steps to solve your Orlando commercial water damage. Even if the water overflow can be traced to the negligence of a tenant, you as the owner are charged with the task of protecting your building and fixtures and ensuring that all those who live in or operate a business within your commercial property have the use and quiet enjoyment of their leased premises quickly restored. SERVPRO understands how important it is to limit the downtime of your and your tenants’ business operations. We make every effort to clean and dry the structure quickly, staging the restoration process with an eye to reestablishing business operations even before the entire remediation is accomplished if appropriate and safe. Preventing secondary damage from contaminated water is a major goal, made more attainable if we are involved as soon as possible in the process. Our services for you and your tenants can also include a pack out and detailed inventory of documents soaked by the water. We follow up with our state of the art procedures for saving and drying paperwork, books, pictures and other crucial work products you and your lessees may have feared would be lost due to the water infiltration. If your commercial property has suffered water damage, call SERVPRO of Livonia immediately. We can be reached at 734-744-8104, twenty four hours a day every single day of the year, our technicians eager to return you and your renters to business as usual swiftly as possible. Heavy rain and freezing temperatures, damaging winds, sleet and snow can cause serious and costly property damage to your home or business if you are not ready. You can't control the weather however you can make provisions and be prepared to help take the sting out of winter weather. Protect your property by taking these precautions before colder weather hits to help prevent costly damages from old man winter. Inspect tree limbs and branches around your property. Strong winds, heavy rain, snow and ice can cause branches to fall, which could potentially lead to damages to the structure and even cause personal injuries. Inspect the roof, water pipes, and gutters to ensure they are in proper working order. Direct gutter downspouts away from your structure. Clear all debris from gutters. Leaves, pine needles and other obstructions can cause a damming effect, which can lead to roof damage and interior water problems. 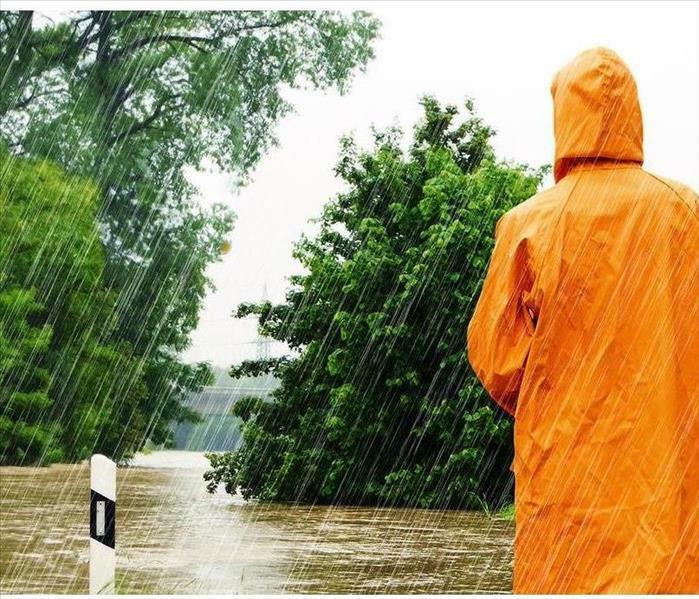 Inspect walkways and parking lots for proper drainage to alleviate potential flood hazards. Inspect all handrails, stairwells, and entryways to prevent potential slippery or hazardous areas. Install mats or non-slip surfaces. Post caution signs where water could be present. 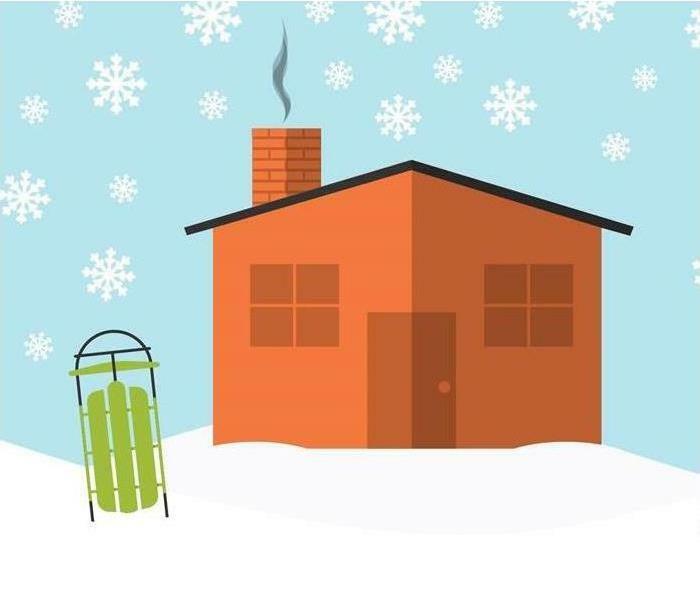 When temperatures dip below freezing, allow faucets to drip to help prevent pipes from freezing. Leaving cabinet doors open allows warm air to circulate around pipes located underneath cabinets helping to prevent freezing. If the structure has outdoor faucets, consider shutting water off at the main valve in the basement or crawl space. Once the valve is off, open the outdoor faucet to ensure it drains, preventing any remaining water from freezing in the pipe. Ask SERVPRO of Livonia about completing an Emergency READY Profile® (ERP) for your business. The ERP is a no-cost assessment of your facility and provides you with a plan to get back in business fast following a disaster. Hit hard by mother nature? SERVPRO of Livonia provides 24-hour wind and storm damage restoration service in Livonia. To get help fast, call SERVPRO! Property damage caused by severe weather can be devastating to your family or business, and repairing it can be a complex undertaking. To get storm damage repair completed quickly and safely, you need a restoration service company that specializes in bringing your home back to its preloss condition. SERVPRO has successfully rebuilt tens of thousands of wind-damaged households through the years. It is in situations like these that our team’s specialized skill sets are required. Rebuilding part of a home is very different from a new construction facility. Building materials, design, and finishes must all be matched to the remaining structure, while moisture remaining in the building components may need to be addressed as well. SERVPRO of Livonia is licensed and insured contractors that are available 24 hours a day. Call SERVPRO (734)744-8104 or find us on the web for your best storm damage restoration costs inspection estimate! Save money and time on Storm Damage Restoration Costs in Livoinia. When catastrophic water damage happens to you, SERVPRO Livonia Professionals can help. They can help you prepare ahead of time with an Emergency Ready Profile (ERP), or respond to any size disaster to begin cleanup and restoration to get you back in business as soon as possible. When water intrudes into your property, mold growth can start in as little as 48 hours. Consider the following mold facts: Mold is present almost everywhere, indoors and outdoors. - Mold spores are microscopic, float along in the air, and may enter your home through windows, doors, or AC/heating systems or even hitch a ride indoors on your clothing or a pet. - Mold spores thrive on moisture. Mold spores can quickly grow into colonies when exposed to water. These colonies may produce allergens and irritants and have the potential to cause other health effects. - Before mold remediation can begin, any sources of water or moisture must be addressed. Otherwise, the mold may return. - Mold often produces a strong, musty odor, and that odor can lead you to possible mold problem areas. - Even higher-than-normal indoor humidity can support mold growth. Keep indoor humidity below 45 percent. - Stay out of affected areas. - Turn off the HVAC system and fans. 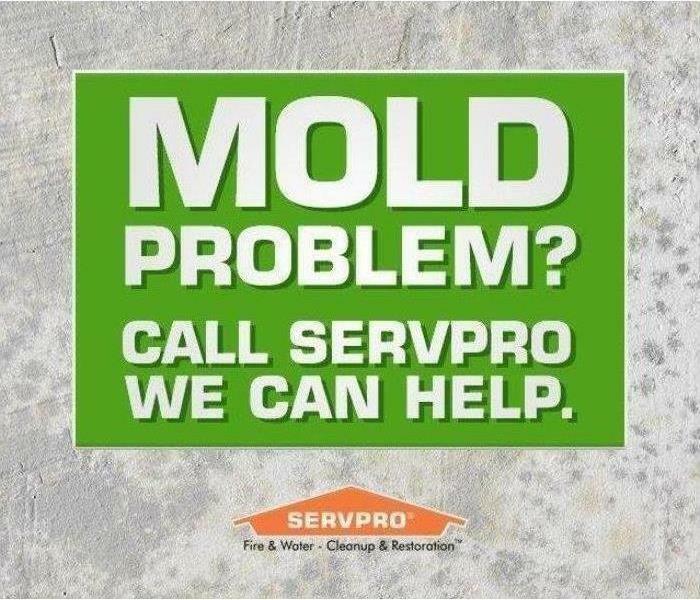 - Contact a SERVPRO Franchise Professional for mold remediation services. - Don’t touch or disturb the mold. - Don’t blow air across any surfaces with visible or suspected mold growth. - Don’t attempt to dry the area yourself. Your organization's risk needs will vary depending on the specific industry, size, scope, and location. Begin by reviewing your business process flow chart, if one exists, to identify operations critical to survival and recovery. Carefully assess your internal and external functions to determine which staff, materials, procedures, and equipment are absolutely necessary to keep the business operating. You should also establish procedures for succession of management. Inadequate insurance coverage can lead to major financial loss if your business is damaged, destroyed, or simply interrupted for a period of time. Insurance policies vary; check with your agent or provider about things such as physical losses, flood coverage, and business interruption. Understand what your policy does and does not cover. Your employees and co-workers are your businesses' most valuable asset. Communication is central before, during, and after a disaster. Include emergency information in newsletters, on your company intranet, in periodic employee e-mails and/or other communication tools. Some disasters will require employees to leave the workplace quickly. The ability to evacuate workers, consumers, and visitors effectively can save lives. If your business operates out of more than one location, establish evacuation procedures for each individual building. If your company is in a high-rise building, an industrial park, or even a strip mall, it is important to coordinate and practice with other tenants or businesses to avoid confusion and potential gridlock. Install fire extinguishers, smoke alarms, and detectors in appropriate places. Secure all entry and exit points and plan for mail safety. Plan what you will do if your building, plant, or store is not usable. Secure valuable equipment. IICRC is the Institute of Inspection Cleaning and Restoration Certification. There are many courses and certifications that SERVPRO technicians have obtained to guarantee better service for our customers. 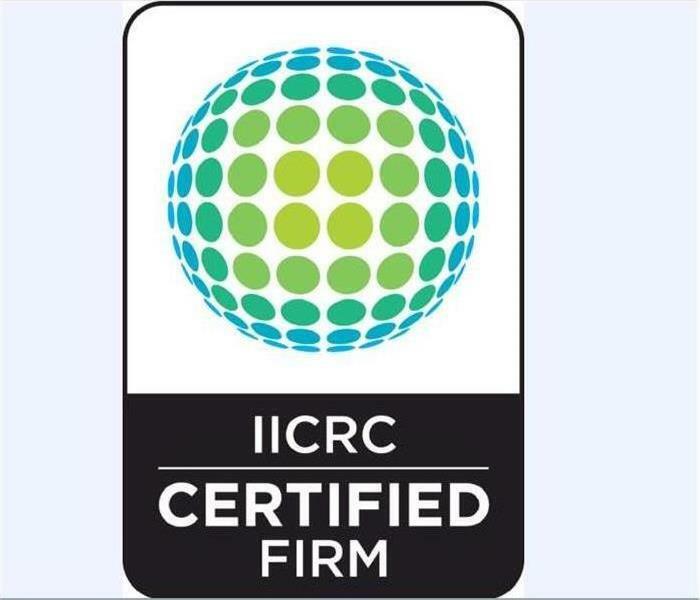 The IICRC sets industry standards across the board. They cover everything from cleaning techniques to fire and water damage restoration. They also do extensive training on Mold Remediation. To stay IICRC certified, there are constant re-education courses required. SERVPRO of Livonia, requires that their lead technicians are IICRC certified. For the last 4 years we have had an IICRC technician on every single job site for the duration of the project, to make sure you, the customer, receives the highest quality of service. When a SERVPRO IICRC Certified technician enters your home, they are equipped with in depth knowledge of how to assess the damage that has occurred, and then the best tactics to not only stopping further damage but restoring the items you currently have. SERVPRO Livonia, holds itself to the highest standards in the industry to best serve our customers and our community. Modern building materials including wood, drywall, grout, and wallpaper are all appealing food sources for mold. All they need is a little moisture, and mold spores can take hold and create an entire colony hidden behind the walls, beneath the floor, or above the ceiling in your home. With homes built the way they are today—tightly, with energy efficiency in mind—water from a leaky roof or vapor from the dishwasher can easily get trapped inside. This creates a recipe for disaster, one that could cause health effects. Hidden mold can also destroy home value by damaging its structural integrity. It’s something you want to get rid of as quickly as possible. Hire a professional: The easiest and best way to find out if your home has hidden mold is the hire a professional mold remediation company like SERVPRO. We know how to quickly and successfully find and eliminate mold in your home while causing the least amount of disruption to your daily life possible. Some of the other methods listed below can be challenging to perform without the help of an experienced pro. Check the roof for leaks:Visit the attic and pull up insulation to check for hidden mold there. Roof leaks can also result in ceiling water stains and sagging drywall, other indicators for hidden mold growth. Check for leaky pipes: This obvious sign of water intrusion could be causing mold growth on the other side of the wall. Examine all fixtures for leaks, including the bathroom and kitchen sinks, toilet, refrigerator, washing machine, and all other water and sewer supply lines. Test the humidity with a hygrometer: If any rooms have relative humidity higher than 60 percent, hidden mold is likely in that area. Examine the inside of cabinets: Remove drawers and look thoroughly at all wood surfaces in kitchen and bathroom cabinetry. You may even need to remove the cabinets in their entirety to examine the wall and floor beneath the installation. This, however, will most likely require the help of a professional. Have the ductwork inspected: Mold can grow inside the ductwork and spread spores all over your home. An inspection from SERVPRO may reveal the problem. Have the ceilings, walls, and floors tested for dry rot: Elevated internal moisture and dry rot is an indication that hidden mold is growing there. Remove sections of wallpaper: Cut one-inch square pieces from the wallpaper every several feet. Examine the backside of the samples for mold growth. Cut holes in the drywall: This can be seen as a drastic move by many homeowners, but if you have hidden mold behind the walls in your home, it’s important that you find it as soon as possible. Use a flashlight to examine the wall or ceiling cavity. Smell the air and try to pick up on any musty odors that indicate mold growth. SERVPRO has the expertise and knowledge required to remove mold from the basement, crawlspace, attic, or anywhere else it has started growing in your home or business. Call 734-744-8104 today if you suspect mold anywhere in your home or business. Chlorine Bleach is often regarded as the answer for stopping mold growth and removing the mold. However, this is a myth. Bleach does not exonerate mold. 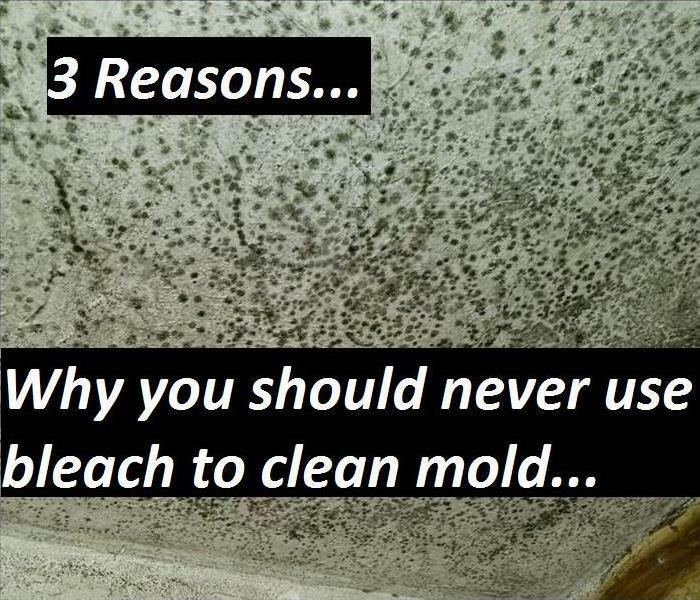 Here are three reasons why bleach is not the answer to mold, and should never be used to clean a mold contaminated area. Chlorine bleach can dissipate rapidly, causing the bleach to be less effective. Over time this occurs because chlorine can evaporate and even faster in areas that are above room temperature. When the chlorine disappears, the bleach bottle turns into a bottle of salt water. Chlorine bleach was made to clean surfaces, therefore can only kill surface bacteria and mold. This is due to bleach’s ion structure, which prevents the chlorine from penetrating porous material such as wood and drywall. When mold grows in porous areas, the enzyme’s roots grow deep within the material, rendering the bleach ineffective of exterminating the mold. The bleach can only remove the green stain from the mold, allowing surface to appear clean. But underneath the surface, the water component of the bleach penetrates and helps the internal roots to continue to grow, causing mold to reappear. Bleach emits harmful fumes that pollute the air we breathe and can cause health effects to humans and even pets. Also research shows that household bleach is one of the leading causes of accidental poisonings in the United States. 1/15/2018 - Does your business have a plan?